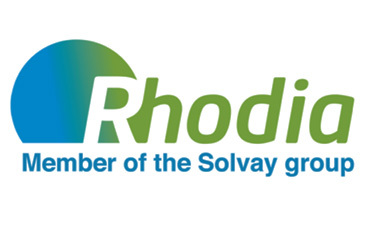 Lyon, France , July 30,2012 — Rhodia is strengthening the positioning of its production line for specialty fluorinated aliphatic derivatives in Salindres in response to the strong growth of its strategic markets. Rhodia is boosting its production capacity for triflic acid and anhydride (TA, TAA), as well as for Lithiumbis(trifluoromethanesulfonyl) imide (LiTFSI), to meet the rapidly expanding requirements of electronic applications (such as antistatic applications for flat screens, ionic liquids and liquid crystals), the battery market (for automobiles and computers) and the pharmaceuticals market. This investment will allow the group to double the capacity of its entire fluorinated derivatives production pipeline at both Salindres in France and in China. The project’s first stage is currently underway and the first additional volumes will be available as of September, this year. With its unique, patented technologies, Rhodia develops numerous fluorinatedaliphatic derivatives for specialty markets that are used in a wide range of applications, such as the derivatives used in electronics, batteries and pharmaceutical applications. “With this expanded capacity, Rhodia is strengthening its role as a major innovative player in rapidly expanding markets while supporting the growth of its clients through this ambitious project,” affirms Alessandro Chiovato, director of the Crop Protection, Health & Electronics BU. The Aroma Performance company (GBU), part of Rhodia's “consumer chemicals” cluster, is the world leader in the production and sale of LiTFSI. Through its Crop Protection, Health and Specialties division, Rhodia offers intermediates and molecules for the agri-food, pharmaceuticals and electronics markets. Rhodia, a member of the Solvay group, is a specialty chemical company resolutely committed to sustainable development. As a leader in its businesses, the Group aims to improve its customers’ performance through the pursuit of operational excellence and its ability to innovate. Structured around 11 Global Business Units, Rhodia is the partner of major players in the automotive, electronics, flavors and fragrances, health, personal and home caremarkets, consumer goods and industrial markets. Rhodia employs 14,250 people worldwide and generated sales of €6.17 billion in 2011.